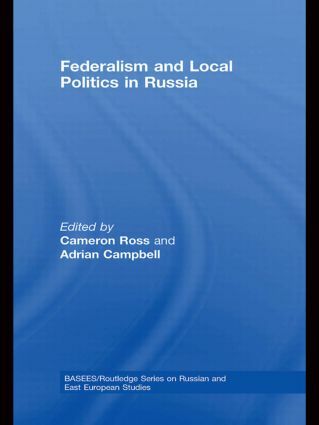 This book examines federalism and regional and local politics in Russia. Many commentators have alluded to the unique nature of Russia's dual transition and its difficult task of simultaneously reforming its economy and polity. But there is in fact a third transition under way in Russia that is of no less importance, the need to reconfigure central-local relations and to create a stable and viable form of federalism. Federal states are much more difficult to set up than unitary ones, and forging a new federal system at the same time as privatising the economy and trying to radically overhaul the political system has clearly made Russia's transition triply difficult. The book discusses how Vladimir Putin has re-asserted the power of the centre in Russia, and tightened the federal government's control of the regions. It shows how, contrary to his rhetoric about developing Russia as a free and democratic state, authoritarianism has been extended - through his reorganisation of the Federation Council, his usurpation of powers to dismiss regional assemblies and chief executives, and his creation of seven unelected super-governors. The book explores a wide range of issues related to these developments, including a comparative study of Russian federalism and local politics, ethnic federalism, the merging of federal units, regional governors, electoral and party reforms, and regional and local politics. It also includes case studies of local and regional politics in specific regions.